52,009 B.C. to 28,750 B.C. And the rest of the world. The ascending Yuga's. The Golden era: the cities of Gold, Silver and Crystal. The coming again of Gods of men and woman, Titans and E.T.'s. The lands of the giants and the stature of human beings of this time period. 52,000 B.C.~One decade after the first subsidence and downsizing of Atlantis, the AL-3000 Atlantean S.I. satellite took one last Image of the 'new' size Atlantis. The satelite had lost all contact with its 'creators', and shut down shortly after the last image was taken. Lava was still flowing across Atlantis, and new lands and high mountain ranges surfaced above sea level in many different locations upon the Earth. The atmospheric manifold/vapor barrier had been damaged, and for centuries afterword was observed the unknown and strange white substances of ice and snow, covering higher altitude areas! Above: Future location of the North American continent Circa @ 49,000 B.C. ~ Far Western Atlantis and the new mountainous island chains then above sea level. The Atlanteans were a generous and open people when Mu existed, who tried greatly to ease the suffering of their Lemurian brothers and sisters. Post sinking Atlanteans were much traumatized: by the loss of the Lemurian peoples, continent and its civilization; by the violent loss of 1/3 of the Atlantis itself; and by planet wide natural disasters caused by these sinkings. The Atlanteans had respected and admired the Lemurians, for having the 'first' civilization. The Lemurians had also advised the Atlanteans to pursue growth and technology ("only for the greater good of the whole") as it were. The loss of the Atlanteans "kinder and gentler big brothers and sisters", and the splitting of Atlantis right down the middle (that 'split' still exists today as the now submerged Mid Atlantic ridge) were the worst of the hurts, and caused much upheaval in the Atlanteans of this era, and its civilization and infrastructure were never the same afterword. There was then a long period of chaos and decline on Atlantis (as well as Globally), before the recovery of "New Atlantis". This corresponds with the descending Yuga cycle, as describe on page 12. In addtion to the damaging of the atmospheric manifold and great loss of land, Humans, animals, and plants, there were other nourishing qualities of both Spirit and Earth that were diminished by this catastrophe. This diminishment would have profound effects on the sizes of all life on Earth at this time, especially animals and Humans. Animals and Humans of suceeding generations did not grow as tall in stature. While the animals and people of this time would both be called giants from our present day perspective, they were diminished as compared to their predecessors. Before the sinkings, titans had literally walked the Earth! This was the first time that moving life forms of Earth shrank after a global disaster, but it would not be the last! Geologically, Atlantis never again had the stability it had before the sinking of Lemuria. From this time forward, Atlantis at times would lose and gain land to the sea! Earthquakes became common, though most were not large. At least a few volcano's were always active, and when the later Atlanteans started re~experimenting with technologies that were not quite under their control, there came to be periods where many volcano's were always active. Later life under these eruptions would not have been pleasant, except by then the Atlanteans had re~invented climate, weather controls, and later e/m shielding. Earth Geography Circa 49,000 B.C.~ The lands and high mountain ranges recently pushed above sea level. With Human civilizations wrecked and/or in decline as of 49,000 B.C., certain explorers still roamed the Earth. They found a new large ocean where Lemuria had been, (then muddy and as yet un~navigable), that would eventually called the Pacific Ocean. This also found a new island continent, the largest remnant from mighty Mu, that would eventually be called Australia. In Australia, new high mountain ranges had risen up caused by the Earth shifts of Lemurian and Atlantean disasters. These new highest craggy mountains in Australia would eventually be worn down, and called the Blue mountains of Australia's eastern seaboard. Another new, high and volcanic mountain range in northwest Australia would eventually be worn down and called the Kimberly. Elsewhere, New Zealand, Hawaii and other pacific island chains, remnants from Mu, stayed above the waves. Prior to the Lemurian sinking, a large Australian size low land salt marsh area had been emerging, to the west of present day Australia. This area, originally called the salt marshes of Sa~id, fully emerged after the sinking of Lemuria, and became lush and habitable. This island continent, to be eventually known as India, was not yet near what would eventually be the Himalayan mountains to the North. At this time period, future India existed a 1,000 miles south of it's present location. This new lush island continent is where most of the Lemurian survivors escaped and settled. India (and Tibet) to this day have some Lemurian knowledge, even if the original source is no longer remembered. Later during the Great Flood, India, being shoved a 1,000 miles north by cataclysmic Earth changes, slammed into a newly emergent land mass west of the Gobi continent, which caused the first rising of the Himalayan mountains. This has been the only time that a land mass of this size has been moved horizontally (and still remaining above sea level), with all other major shifts of Earth having been vertical raising or lowering. There are deeper reasons why this is so, but this goes beyond what needs to told in this website. Nearer to the Atlantean west coast of this period was a new high island mountain range. This new high craggy island mountain range would be worn down during the coming Great Flood, and called the Applachian mountain chain. 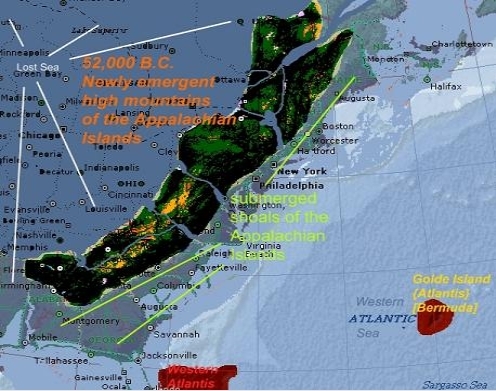 During this era however, there was no North American continent, and the Applachian island mountains existed by themselves in a very large sea, with Atlantis to the east. Other new North American islands came to be in what would later become the four corners area of the U.S. and the Great lakes area. In the areas now known as the Rocky mountains and Sierra Nevada mountains, what previously had been sea bottom had now risen up to be shallow underwater showls, a new hazard to Atlantean mariners of the the time. 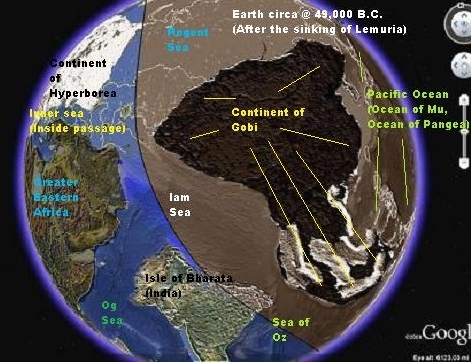 And finally, Lemuria's far east coasts were not only left above water after the mega continents sinking, but were pushed up to eventually become coastal mountain and hill ranges of both North and South America. At this time period however, these ranges were not part of any continental land masses, and were surrounded by the new Mega Pacific ocean. Africa had for a long time called the crescent continent, yet after the sinking of Lemuria and parts of Atlantis, the crescent aspect had started to fill in. Africa had gained some land to it's west, and North. A few high mountain chains had also been pushed up during the above events. 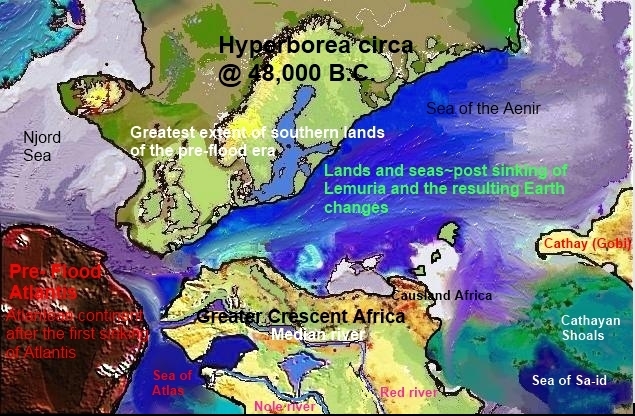 Hyperborea,participating as observers during the Atlantean attempt to help Lemuria, lost some land mass, to it's North and west. Gobi also lost land, especailly on it's southern shores. There were two new mountain ranges. Antarctica, pre Mu sinking was a small island surrounded by underwater shoals and salt marshes. Post sinking, it enlarged in size, and gained two companion islands both about the size of present day Sri Lanka. The total land area then was only 1/3 the size of present day India. The 3 islands of Ur~Antarctica were (at that time) not the South Pole of the planet, and ice and snow free. The Third Atlantean civilization and technology. The first Atlantean civilization was long ago, with the Original Poseidon, 1st King of Atlantis, and his faithful friend and Master of Arms, the giant named Atlas! 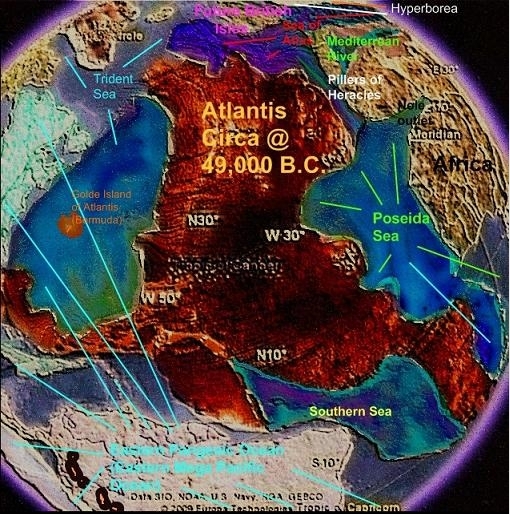 The second Atlantean civilization was the recovery after the 'long decline', the eventual helping of Lemuria, and the development and activation of the Great Crystal! This third civilization of Atlantis emerged around 47,000 to 46,000 B.C.. With the Earth shifts from the sinking of Lemuria, Atlantis was now much hotter in temperature than before. The Atlanteans of this period recalculated and repaired the damaged 'atmospheric manifold' and vapor barrier. Even after the repair, the residents of Earth of this era saw periodic 'storms' of color', along with intense rain, and something new~lightning and thunder! The atmospheric manifold, though still able to be weather modified, was slightly, permanently de~stabilized after the Lemurian cataclysm. Atlanteans and others then further modified local climates, and were able to instigate city wide 'dome' temperature and weather control, including air conditioning. With the Great Crystal repaired, a newer generation of Atlanteans started looking for ways to boost its power, and decrease its limitations. The Ley Line/Grid/Pyramidal enviromental power and transport systems that had preceded the Great Crystal were drastically altered, and somewhat destroyed by the pervious cataclysms which shifted the Earth's magnetic fields and Ley Lines. Though no longer a main source of power for the Atlanteans after the Great Crystal went online, these secondary systems were also eventually rebuilt and realigned, not just in Atlantis, but other in many other locations as well. As depicted in our collective 'fiction', Atlanteans went on the reinvent other energy sources such as ZPM's, and offshoot of crystalline technology. From 46,000 to 41,000 B.C., Atlanteans and other Earth civilizations were again fruitful, and multiplied. From 41,000-31,000 B.C. the Earth it's parent Solar system basked in a new Golden period. 44,000 B.C.~ E.T'S return to Earth! In this time period, Prom~e~thus and his crews, (the original E.T. bringers of the Great Crystal technology and manufacturing that provided power for Atlantis, its colonies, and others), were long gone. Prom~e~thus had seen the Atlantean's misguided attempts to help the Lemurians (with their rampaging, multiplying giant size animals and dinosaurs) using multiple low level 'Nuclear' devices all around the continent of Lemuria (and elsewhere). Prom~e~thus saw that not all of Lemuria would have sunk, and not with some of the violence that it did, if they had not used the ' Crystalline Nukes' and high level technology of the time. So he and his crews, sensing the potential for the Atlanteans to further misuse their Crystal technology, withdrew themselves and their technical support from the Earth. These 'new' Atlanteans now took full responsibility of maintaining (and 'improving') the Great Crystal. But by 44,000 B.C. other races of E.T.s, long watching the Planet Earth and Atlantis in particular, decided to once again intervene, and help with technology! And there were two projects in particular they wanted to help with: Project Stargate, and Project Adam and Eve Version 2.0: The Cro-Magnon construct. Starting about 45,000 B.C., Atlantean, Hyperborean, Gobi (Cathay), African, the new land called Bharata (India) and other Earth civilzations again began to grow, and flourish. Even with the new time and new growth, what had transpired before had not been forgotten: The loss of Lemuria. Atlantis and Hyperborea also suffered much loss of lands, and life. Both continents had shrunk almost drastically, as compared to their previous sizes. Even with the new growth of life and knowldge, there was much reflection throughout the world, as to what had happened, and how it had happened. Humanity of the time, circa 43,000 B.C. went through a period of much self doubt. This self doubt of whole societies brought a collective focus towards Holy Men and Woman, the Oracles of this time period, and finally Creative~Intelligence itself. For a time, all was good. Never before and never since had the world prayed together seeking a sign, to both resolve the destruction of the past and to go forward into a better future. And Spirit replied: Come let us, let us make someone new, someone better, who can both start afresh and who can lead the world into a new time of harmony. The Atlanteans, who had never quite given up on genetics, had a template. And so it was decided that a new upgraded version of humanity, Cro-Magnan would be born! Much work was to be done, and with much praying for direction. Finally, about 42,000 B.C. with the Solar system re~entering a Golden era of high knowledge, and with the blessing of the Great Saints of the day, two thought form vortexes were formed in Eastern Atlantis. After much more work and preperation and with E.T help, life began to gather within the thought form vortexes. First was born/made Cro-Magnan Adam, and from the template of this 'Adam Cadmon' (Cadmium man) a Cadmium woman namded Eve was born/made in the second vortex. Fully human with upgrades, in harmony with Spirit, Earth, and the elemental beings, Cro-Magnan Adam and Eve stepped forth. They were Homo Superior. Even though their color was red, in their genetics they contained within all the templates of humanity, even a sixth 'code', this one of blue. They were also called the 'shining ones', and the 'pure ones' After a time in Atlantis, this Cro-Magnan man and woman traveled to what we know now as the Middle East, and thus the story of both them and their family begins. Cain and Able: The anger of Cain, the Mark of Cain. Cain and Able, along with their mother and father, the new Cro-Magnan Adam and Eve, did well in their new lands, the lush Middle East. Friction did exist between Cain and his brother Able however. Before the sinking of Lemuria, most of the human population on Earth, for a very long time, ate what we would call vegetarian. In this new Earth sans Lemuria (and the cataclysms that when with this), food in many areas was not easy to come by. Humanity, as it was then had to resort to being omnivores. And for a time, this was good. A disagreement between the brothers arose.. The source was with Cain, who could not understand how Able could be an omnivore, when there lush patch of land in the Middle East was abundent with plants. Cain also was a traditionalist, and he saw it that since humanity for a long time had been vegetarian, then his brother should be also. Later, with Cain being more frustrated with his brother, the disagreements became arguments. Able was at Peace with the world, and his own ways of living. Cain, after a time, was not at peace with his brother. Cain developed a 'holier than thou attitude'. Cain eventually came to feel disgust with his brother, and no longer felt his brother as 'friend'. Able began to wander far at this time, indulging in his wanderlust of the planet. After one particularly long time away, Cain, upon seeing his 'brother' return (and feeling happy and at Peace about his meal of meat), flew into a rage. Cain attacked his brother Able, and Able defended himself. This infuriated Cain more, and thus did Cain hit his brother Able once more, very hard. Able did not move after this, the hard blow was too traumatic. Able, at Peace with his life, had been a Holy man. When the final blow was struck by Cain, the Earth itself and the elementals let out a shriek of grief. Spirit itself confronted Cain after this, asking why he had made the final blow. Cain, humbled, wondered the Earth for a very long time. After a long time, Cro-Magnan Adam and Eve, still in the Middle East, had another son. This son in turn married one of the daughters of 'regular' humanity, and thus the Cro-Magnan's legacy continues. A man name Noah, would be a part of this legacy. The Star Gate complex, and it's operations. About the same time that the new Cro-Magnan man and woman were being born/created of of thought vortexes, the E.T. 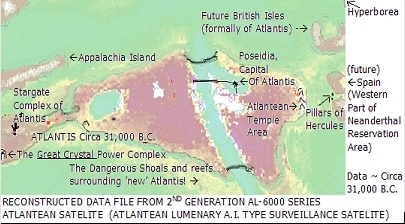 's and Atlanteans were planning on a massive travel complex in West Central Atlantis. This complex had no major surface, air or underground linkages. Air disks and cylinders were restricted over the area. The E.T. crews helped the Atlanteans construct Large crystals never before seen on the Earth. They seemed to shimmer brightly at times, were dull at others, and sounded like they softly hissed! They were very different from the Great Crystal, other secondary power crystals, and the healing crystals. There were workers, as they were finishing the crystalline installation into the complex, sometimes faded from sight, never to be seen again! As work neared completion, there were even more strange flashes of light and sound, and sometimes peculiar FLAT beings were seen! The Atlanteans confronted the E.T. groups who provided technical guidence, and the E.T. 's redoubled their efforts with the Atlanteans to stabilize the complex. An massive black satelite was constructed half way between the Earth and Moon. This Cosmic ray powered Black A.I. station helped stabilize the crystals inside the complex. In Midsummer 40,023 B.C. the 'Trans-station' opened! It allowed any Atlantean to beam travel instantaneously most anywhere in the Galaxy (and then some). And more interestingly, a person could tranfer into other, alternate Earth universes. No other previous Atlantean civilization before or after this one had this, the Star Gate. In some ways, this civilization of Atlantis, (before the dark times and eventually Global war and worse), was the highest technically and materially of all Atlantean civilizations. The Great Crystal provided power to this complex, but the building also had its own power crystals of smaller size. The building was huge and circular, built somewhat like a train hub underground, but the spokes of the 'wheel', instead of having tracks that went into the distance, each instead ended in a wall, (3 meters from the entrance) of shimmering irridescent light that continually shifted, or reflected different colors. Sometimes sound could be heard through the shimmering walls of light. The strange unearthly 'transport/transdimensional' crystals were not directly seen, but were placed in the floor under the shimmering walls of light. After speaking to the A.I. in charge of that particular portal (the E.T's did this function at first, until the A.I. 's were operational), and a wait of 15 seconds while the A.I. 'tuned' the frequency of the destination, one then walked the wall of light, and into the destination, or other dimension! In this way, in later dark days before the war, some Atlanteans and others left the Earth, and never came back! Explorations of this Golden era. The return of the God's, Titan's, and men of reknown. Similar to the last two high periods of planetary development, all life on the planet started upgrading, nourished by the intense beneficial radiations from the center of the Galaxy. Many Animals and some plants, as before became self aware, conscious as humans are. The most intelligent animals of each species would usually band together is specific 'tribes', and some of these built villages and small towns. Some remained more animal like, and others were near pare to human beings in function. A few developed sage/saint like qualities. Some of these are in our 'legends'. Many could master the Humans languages of Earth, (and humans of this time could easily decipher what the animals was woofing/tweeting about as well). So once again, the moving life forms of Earth sometimes walked together, celebrated together, and sometimes the higher animal tribes would help the humans fight their wars,,,,,Plants of these high era's while usually mute, would none the less know the humans intent. Some plants, along with having intelligence, developed either moving vines and /or thorns, or other specific moving defense against being attacked and eaten. While all life forms had shrunk from attrition after the sinking of Lemuria and the planetary/geologic disasters that had happened with this event, during the Golden era's especially, life forms increased in size. So the large animals and dinosaurs became larger, as well as more intelligent. Some dinosaurs, which still existed in this time period, organized themselves enough to travel and hunt in packs. Some human beings of the golden era's also grew much greater in stature, and most folks then had much greater intelligence. This vastly increased intelligence, along with spiritual discipline, gave a few 'understandings of the Gods', and these could act on these understandings accordingly. A few of these advanced and large humans had (or earned, through long disciplined practices) the knowledge of how to fly, and other powers. About 36,000 B.C., Atlantis and the rest of the world reached a new high point in higher knowledge, and technology. This was indeed another Golden era upon the Earth, with communciations, off world colonies, marine, air, and space vehicles, and even Spiritual knowledge freely shared with all. This era of sharing, knowledge, transportation, off world colonization, and peace would not last, however. This era's civilization of Atlantis and other world powers was overall the highest developed Human technical civilization this Earth has ever had, even up to present day. Preceding and succeding era's have overall, not matched this era's physical high technologies. Criminals Rehabilitated: The Atlantean Healing Pyramids, temples and their healing rays. Above: A stormy atmospheric manifold looking out through a crystal wall in an Atlantean temple~ pre Great Flood. During the peak era's of this Atlantean civilization, criminals were not imprisioned or used for labor to serve a sentence. The collective thoughts of the Atlanteans of this time were of awakening, and rehabilitation. Any Atlantean convicted of a crime (not counting the Chimera's or 'new citizens' and migrants) was automatically referred to a Master Healer, and a healing temple with body and brain ray frequencies. What then, was the procedure? The convicted criminal was released in a 'house arrest' type of arrangement, where family members would come forward and would vouch for this persons behaviour, until treatment was completed. In the very rare event of no family members available for this reponsibility (due to an almost immortal lifespan), there were usually members of the public or even healers that would volunteer to take responsibility for the 'convictee', until treatment was completed! The treatment consisted of beaming either light, sound, magnetic, electric or other cosmodyne forces into the certain brain regions that scanning had showed were under functioning or hyper functioning. This was usually followed by beaming the forebrain, to awaken higher level thinking. Thirty treatments in a 10 to 12 week period usually worked, plus a 3 month rest period while the patients brain adjusted and ultimately rebooted into a more awakened and balanced state of consciousness. Around 90%+ were usually helped. For the rare person that wanted to continue his or her crime causing behaviour, banishment from the continent of Atlantis forever was the punishment. Later on, in the dark days leading up to global was that preceded the great Flood, these technologies were subverted by certain sects of high government operatives and others, and the Brain rays became mind control technologies and worse! By 32,000 B.C., the Atlanteans and the rest of the world were (again) experiencing the decline of the Yuga cycles. Atlanteans of this time had decided to re~experiment with a technology that had failed spectacularly before~'Crystalline Gamma Nukes'. This technology had played a large role in the sinking of Lemuria, and the large reduction in size of the Atlantean continent. Yet the Atlanteans of these generations had forgotton most of the strife and disaster that came from misusing this technology, and preceded to experiment. Around 31,000 B.C. a series of miscalculated experiments resulted in a chain reaction, which resulted a more of their continent slipping beneath the sea. This heralded a whole new era of geologic instability, into what had once been a large stable continent. 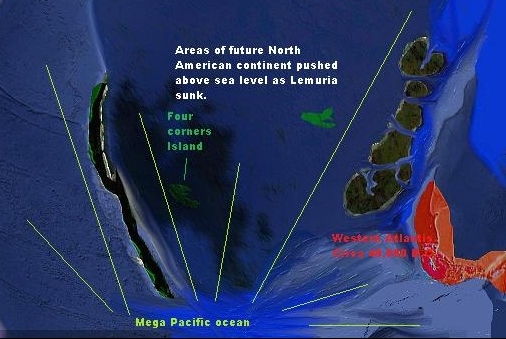 When the Lemurian mega continent sank, not only did some parts of Atlantis sink with it, but the remaining continent developed a crack right down the middle, a warning from nature herself, that went unheeded in this era. A very large tsunami had swept the remaining Atlantean continent also, burying a lot of plant and animal life very deeply. This event would have great bearing upon future Earth events. After the chain reaction experiment went wrong, this crack down the middle turned into a full split. This split, which became several miles wide in some places, became known as the 'Strait of Atlantis'. Volcano's long dorment also re awakened, and from this time until the Great Flood, Atlantis had to continually clean up either from quakes, or from volcanic eruptions. Some parts of the country were no longer pleasent places to be, although these geologically unstable areas did yield both crystals and metals, if one could mine them without being burned, or shook, or worse. After these events occured, and the Atlanteans became very insular, not really trusting anyone outside their own borders, even as the land within their continental border continued to show signs of instability. The E.T. groups who had previous helped Atlantis with their 'Star Gate' and other crystalline technology, began leaving the Earth. The Atlanteans and most other humans of this time period, suffering from the descending Yuga cycle of this Solar system, began to disregard higher ideals and morals, advice from the era's own Holy men and woman, and from the E.T.'s. Long forgotten (and thought resolved) conflicts within the civilizations of Earth began to resurface. The highly advanced A.I. technologies and machines of the time kept technical knowledge from disappearing, but there was no longer any higher minded leadership on Earth. Atlantis seemed to be at the for~front of this 'forgetting' of morals and high ideals. Irritation with other Earth civilizations and city-states increased. New leaders upon Atlantis decided to start punishing those with whom they saw as 'enemies of the state'. These imprisonments and punishments became to be more and more deadly, more dangerous. Other civilizations and individuals protested these increasingly irrational punishments of individuals, cities and whole regions of Earth. Whole regions now struggled under invading Atlantean occupation armies, navies and aircraft. Atlantis then re~activated it's Chimera genetic technology, long shunned. Not only was a new slave class of animal/humans created, but Atlantis then began to really punish and torture human beings by 'retrograding them'. The E.T. groups had seen enough, their own very advanced technology told them a global war was upon the horizon. With the leaving (again) of the E.T. 's, the Atlanteans began trying to improve their very high tech 'swords'. And whom was this enemy the Atlanteans were going to go after now? None other than what became a Lemurian library, the civilization of Gobi! The land of Gobi (Cathay) and it's brother civilization: India of the pre-war, pre Great Flood era~circa 28,750 B.C. Both during and after the sinking of Lemuria, the surviving Lemurians moved to two places. The first was Sa~id (Bharata, India), and newly emerging island continent, and the second place they asked and received answer to move to, was Gobi (Cathay). Later, working with descendents of the Lemurians, the Gobian civilization developed and refined certain technologies such as biology/life sciences, masonry, pyramid building and anti gravity technologies. In this era Bharata (India) was still an island continent a thousand miles from any shore. Yet technology, understanding, help and higher knowledge flowed freely between the two lands. Unlike the Atlanteans of this time, knowledge was freely shared with any who asked. Atlantis had something else that no one else had either; they still had the Great Crystal. Atlantis began work to increase the Great Crystals power and range. Initally, increasing the Great Crystals range and capabilities was supposed to bring power, communications, networking, and other 'tools of humanity' to the whole Earth, without the restrictions or the 'fading of night power' (which had affected the Crystal originally). After making some progress in this regard, the Atlanteans changed their minds; this new improved Great Crystal would not be further shared, and the Atlanteans would only honor already existing agreements. Hyperborea, the fifth continent and civilization, had long looked up to Atlantis as the Spiritual, technical, and cultural leaders of the planet. In this era, most of the population and leadership still did. Yet the Hyperboreans, with the Atlantean re~activation of the Chimera bio technology and especially the retrogradation of human beings, began to question Atlantean ethics. In doing so, Hyperborea re-opened itself up to the idea of talking, and establishing better relations with both Gobi, and India. Above: The atmospheric manifold of Pre Great Flood Earth, at sunset. Time period: 31,000 B.C. to 29,000 B.C. Aggresive tendencies and increasing misuses of Atlantean technology. (The 'enemies of Atlantis').